MORE RARE VINTAGE COMIC BOOK SUPERHERO POSTERS IN OUR OTHER LISTINGS! Hello, DC Comics superheroes! This is a vintage 1986 SUPERMAN promotional poster featuring classic Man of Steel artwork by JOHN BYRNE. 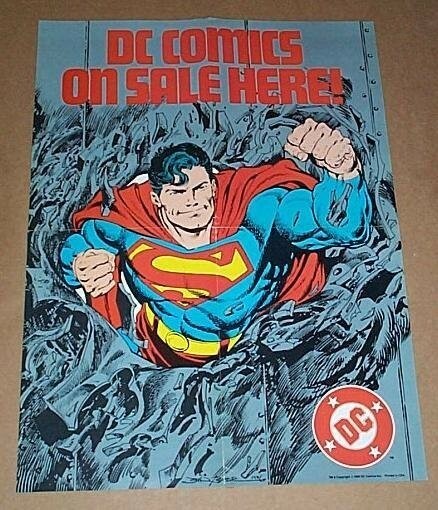 This 1980's scarce comic dealer display poster was produced by DC Comics to advertise several Superman comic book series, like the Adventures of Superman, Superman the Man of Steel, and Action Comics. This 80's promo poster is in UNDISPLAYED VERY FINE/NEAR MINT CONDITION and measures about 22 by 16 inches. This promo poster was sent strictly to comic book retail store owners only, and was produced in VERY LOW numbers (usually just 1 promo poster per store, and there aren't many comic shops left!). Many of the surviving promo posters have no doubt been lost, previously displayed, damaged, or even destroyed over the years. Promo posters are shipped to retailers folded.